I’ve been indulging in some reflective thinking on how I use social media, and how that has changed over time, and how that might change further in the future. That thinking led me to sketch out this engagement cycle (although the version you see on this page was made all digital and that by the lovely Carl Bembridge) to try and visualise that change in usage. The reflection started with the realisation that I use Twitter, in particular, in a very different way to how I used it, say, two years ago. The first reflection was that I don’t ‘talk’ as much as I ‘listen’ on Twitter these days. In other words I’m pretty much a social media consumer these days. Or at least I am on that platform – more on that later. The main reasons for that shift were fairly easily identified – external forces both good and bad but also a slight splintering of my digital identity. While I still mix both parts of my life (digital for local gov and music journalism) under one Twitter account I have split off other bits. For example the music PR and promotion I do is on the Noble and Wild account. However, for all my listening I go through fits of curating. After not saying anything but reading lots I’m most likely to be retweeting or favouriting things. Some of this is about being able to come back to things later on, some of it is because it feels lower risk and less personal than creating. I create all the time but that might not be very obvious from my social media profiles at the moment. Whether it’s writing for Louder Than War, doing music PR, stuff I do at work there’s plenty of creating going on so why do I share it less? Well, it’s those reasons under ‘consume’. Sharing my creations has definitely become a more conscious decision than it was at one point. On further reflection that means I’m creating for other reasons than purely sharing, and that’s a good thing. I don’t think I’m on my first circumnavigation of this cycle. I think I went round it faster when I first started using Twitter in 2008, and I think I might have been round it at least once more since then. 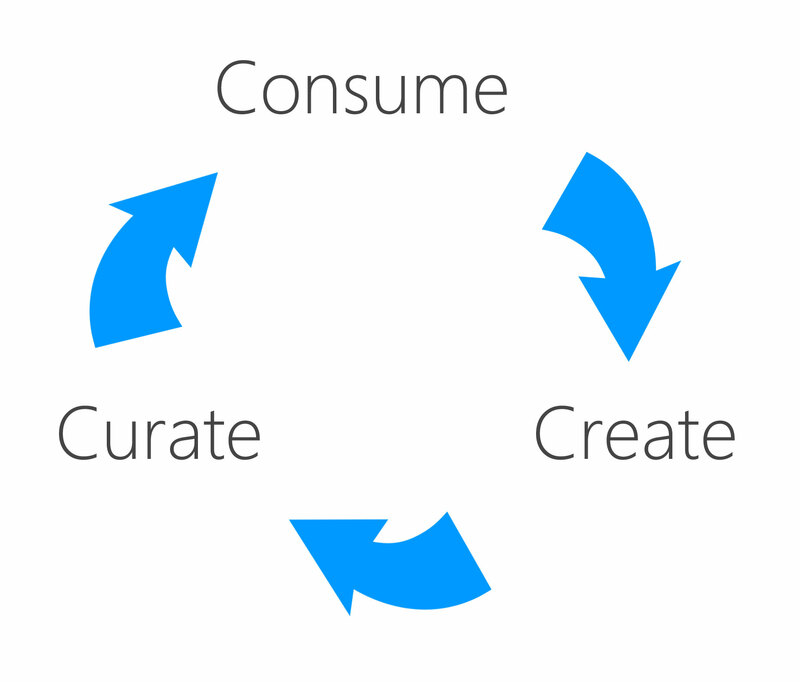 I think this time it’s become a multi-direction cycle – that consumption doesn’t necessarily lead to creation to curation and so on. I think some of it is. And some of it is visible / private specific – for example on Facebook my visible activity has slowed but my use of Chat and messages has increased. And Pinterest is still all about the curation, I probably do less than some but when I’ve got a project on I am pin happy. It’s been interesting to work that out. Some of it is music journalism being a bigger part of my digital identity and that most bands court consumption not engagement on social media (I will probably write about this some other time). Some of it is those changing circumstances. Some of it is that I think other people I once engaged with or find thought-provoking and challenging are also in the ‘consumption phase’ (not to call the rest of my ‘bubble’ dull, just a change in the flow of conversation around me). Some of it is that my interest and time is split across a greater number of platforms. That’s what it means for me. But I did reflect, briefly, on what it might mean for others. In the same way I have noticed a piping down from some voices in my stream I have wondered if others noticed I contribute less? Does it matter? If I’m still reading their blogs, following their links, favouriting, retweeting does it matter if I engage less directly? Ultimately I guess it does – we can’t all be social consumers, someone has to create or curate stuff for us to consume. And so this is a cycle that feeds the engagement process as much as reflects my personal engagement via the social web. Has anyone else noticed, or reflected, on the way their use of social media has changed? You can read my words about music on Louder Than War, follow me on Twitter or search for Sarah Lay on G+ and add me to your circles! Posted in Content, Online community, Social media.Tagged consuming content, creating content, curating content, engagement, engagement cycle, social media engagement cycle. It’s true that social media use ebbs, flows and changes. I find a lot of my time is now finding and favouriting links for @comms2point0 as well as blogging for it. As a result of drilling down deeper in one interest I’ve let other areas drift. Some of that is good. But I do miss the serendipity of coming across things in areas I didn’t know could be interesting. I definitely spend more passively engaging through reading, favouriting, retweeting than I do actively engaging in conversations or tweeting myself. I think I’m moving round the cycle again on that at the moment (perhaps it’s the sunshine or a burst of energy with new shores now in sight). I think my dual life has certainly complicated things further. I wonder how many of the people who follow me for local gov stuff think ‘shut up about music’ and how many that follow me for music think ‘shut up about digital local gov’! I also wonder whether wondering this once too often is part of what pushed me round to the consume phase of the cycle. Next Post Me first: Is responsive design a distraction from good content?